I find it interesting how when I'm doing my own nails it really reflects my mood. I spent a while deciding on the combinations for these nails as I wanted them to be something I was really happy with. After playing around with various ideas and a gorgeous pale gold to pair with the neutrals, I suddenly changed my mind to use rose gold to compliment the shades. CND Shellac in Clearly Pink, Naked Naïveté, Rubble, Field Fox and Beau as well as Lecente glitter in Babydoll and Rose Gold. Also I have a copper / rose gold foil that I've had for a long time (no idea where it was from I'm afraid) that I used to complete the look. Thumb - CND Shellac in Beau with Lecente Babydoll over. I then applied a layer of Clearly Pink over the glitter to seal and cured it. Using a Lecente detailer brush I painted Field Fox onto the sides of the nail to create the glitter strip, curing and finishing with a top coat. Index finger - CND Shellac in Naked Naivete with the copper / rose gold foil scrunched and tapped into the sticky layer. Middle finger - CND Shellac in Rubble and then a glitter paste (a mix of top coat and glitter) with mainly Lecente Babydoll with a tiny amount of Rose Gold glitter for good coverage and then I did dots in a semi circle. Ring finger - CND Shellac in Beau with Lecente Babydoll over. Little finger - CND Shellac in Field Fox with the same glitter mix as the index finger. Like the shade of your index and ring finger. 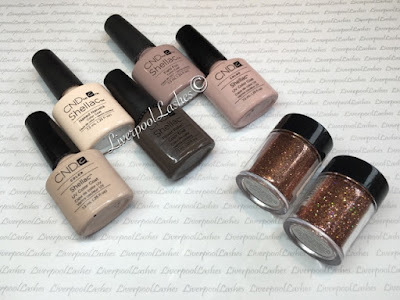 I will also try it with my CND Shellac shades.